Monday, April 1, 2013: Happy April Fool’s Day, hope everyone had a great celebration! We are on the move once again (no joke!). Left Desert Eagle RV Park at 1035, and made tracks for the southeast on The Boulder Highway until we intersected the Lake Mead National Recreation access road. Using our old guy NPS pass we sailed past the entrance station and cruised through the park from north to south. 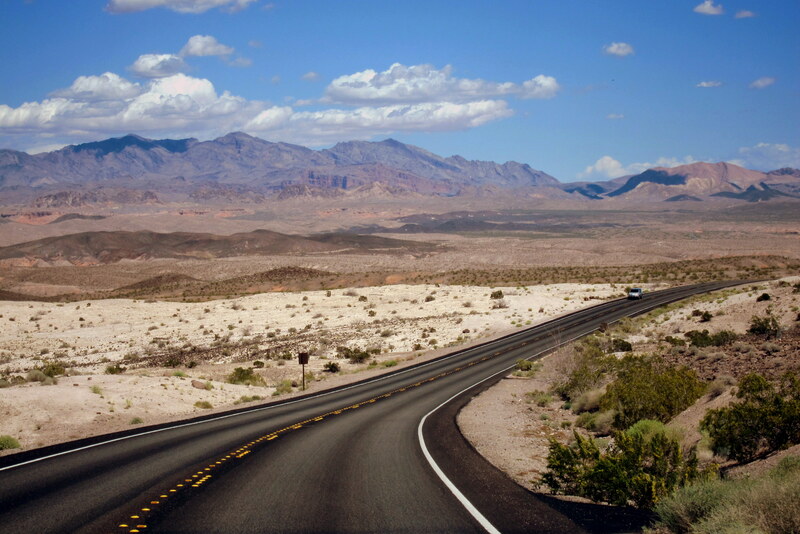 There are other ways to head southeast out of Las Vegas toward Boulder City and the Hoover Dam…..but none more scenic! 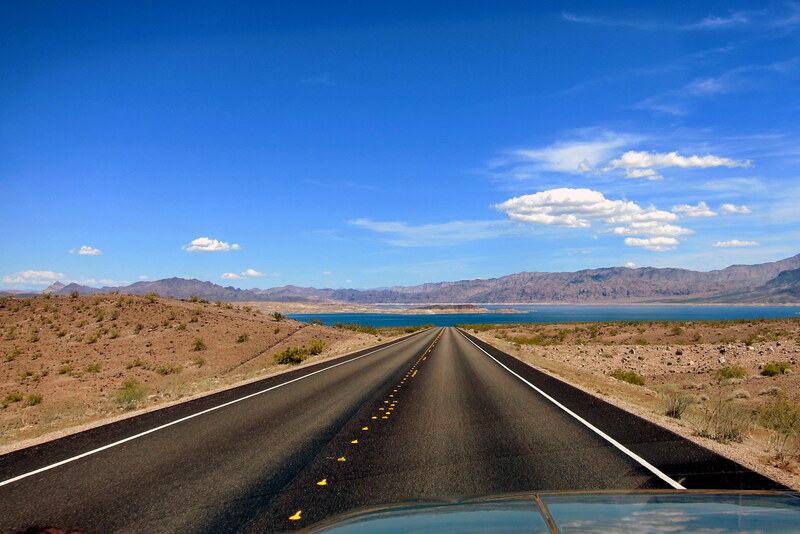 Lake Mead, at 247 square miles is the largest manmade lake in the United States. 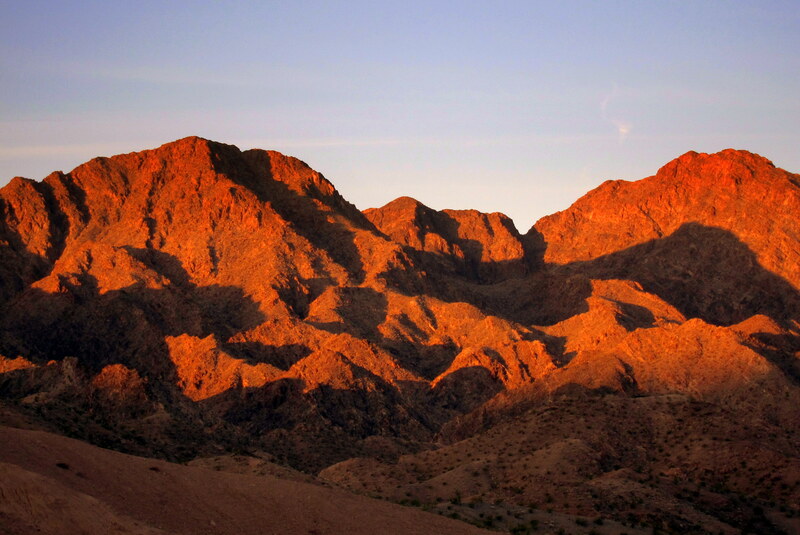 It was developed in 1936 when the Colorado River was impounded by the construction of the 726 foot high Hoover Dam. 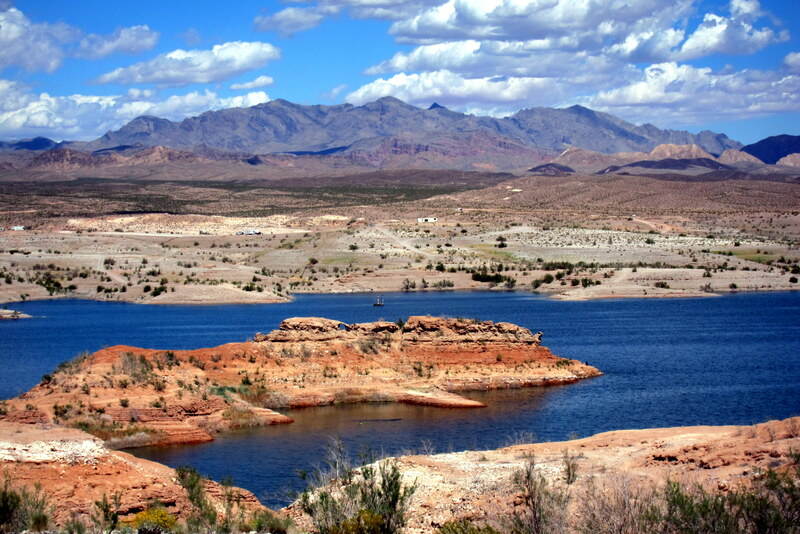 The resulting lake created a major water and recreation resource for the folks in this otherwise inhospitable desert environment and the dam’s 17 Hydro-generators supply power for the region as well. The stark contrast between the desert terrain, blue water and distance of the mountains makes for a picture postcard scene. The lake is currently about 50 feet below average mean water levels due to the persistent drought that has plagued this area the past few years. The normal water level is evident by the white line of deposits depicted in the photo above…..where my rig is parked is the normal boat launch point. 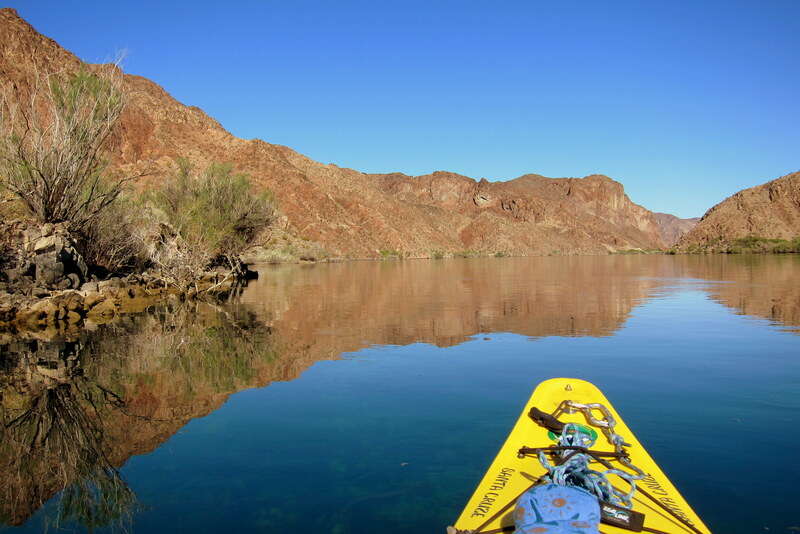 Even with this greatly reduced water level, Lake Mead National Recreation Area is still a nice place to explore, and it is only a few miles from the Las Vegas strip! 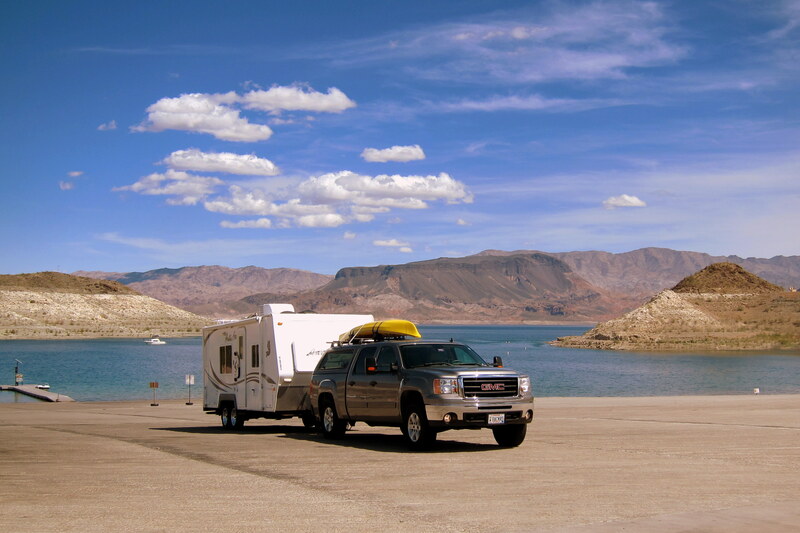 Crossing the new Pat Tillman Bridge into Arizona, we found our way to Willow Beach Campground located south of Boulder City. 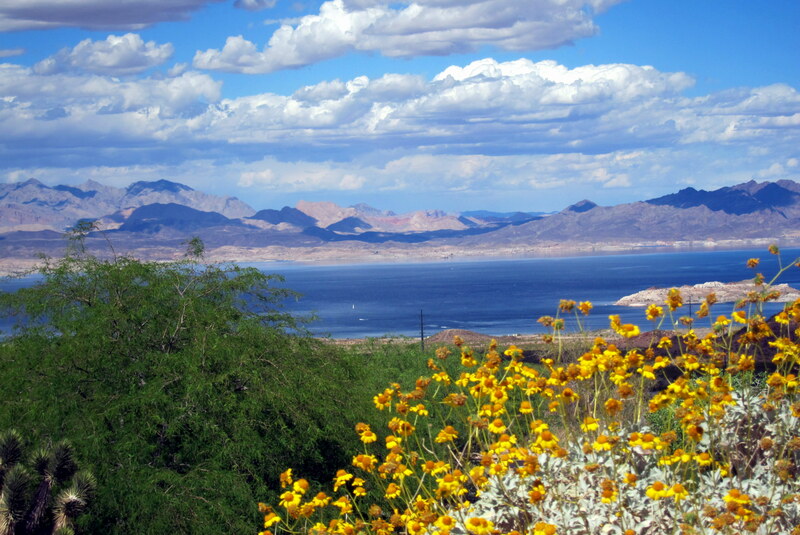 Even though it is below the Hoover Dam, Willow Beach is also a component of the Lake Mead National Recreation Area. Being mid-week, we were able to score a full hook up site for the next two days. 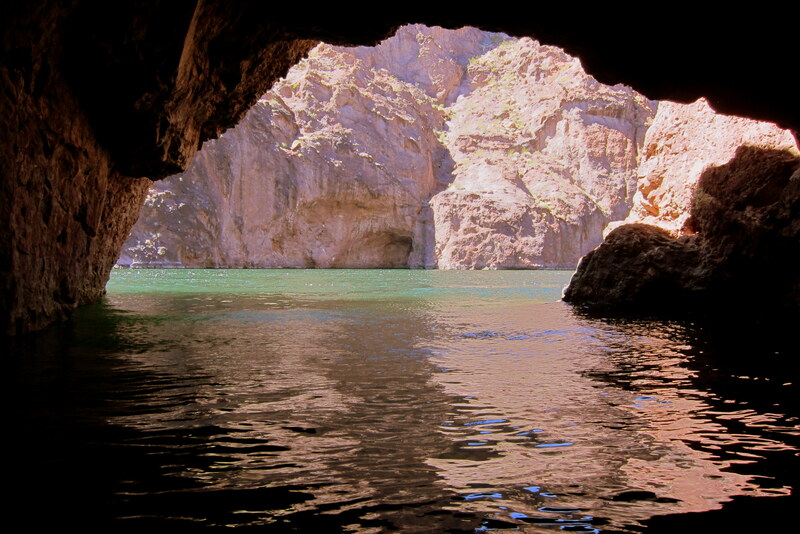 Willow Beach is situated on the east shore of the Colorado River 12 miles downstream from the dam. This is a new campground as the original facility washed away in a spring flood a few years back. Nice spot and an Old Guy NPS card will net a 50% discount on camping fees. The only negative, at least for Kit, is no cell service and no internet. However I’ll have to give her credit, as she spent the better part of an hour carrying her iPhone aloft and walking about in search of any hint of a signal. Oh well, guess she will just have to sit back, relax and do some reading. Tuesday, April 2, 2013-Willow Beach: Woke to a beautiful bright blue mid 60 degree morning…..the early sun was busy painting a scene of color and shadows on the adjacent hillside as I started to plan my day over a cup of steaming coffee. Full well knowing that Kit would like some quiet time and considering that one of the main reasons we (I) decided to camp here for a few nights was access to the Colorado River for some kayaking, I gathered my gear and headed for the river. So off I set under warming skies with everything I needed for a paddle up the river stored in the rear dry hatch. 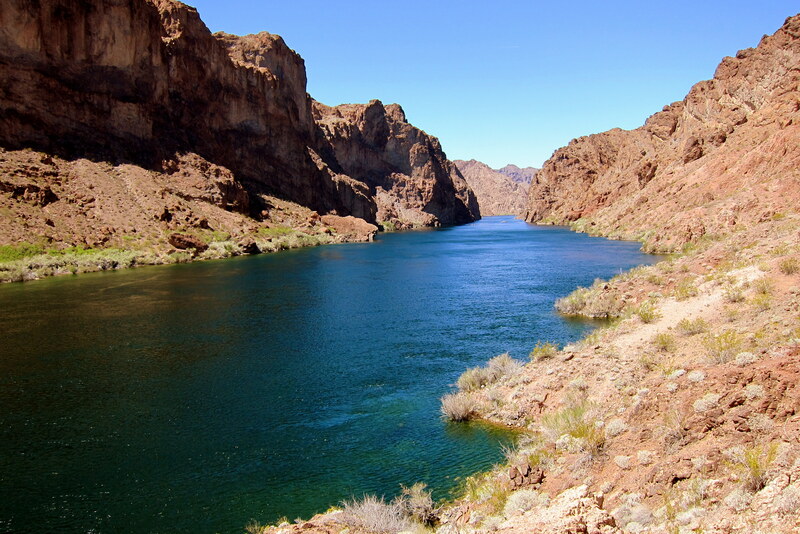 This part of the Colorado is known as Black Canyon, and before the Hoover Dam existed the river was very turbulent due to the narrow canyon walls. This portion of the Colorado may have featured more quick water today if it hadn’t been for the creation of Davis Dam 50 miles downriver. However at Willow Beach the river has some current due to the spillway from the base of Hoover Dam and flows at a little over one MPH. Generally, The Colorado is warm and full of red silt, however at this point in its travel it is cold and crystal clear. The photo above was taken in about 10 feet of water. Notice the shadow of my kayak and, if you look closely, you can even see the shadow of my arm holding the camera aloft. On a previous Excellent Adventure trip, I paddled this area and explored downriver…..this year I decided to paddle upstream. After a few miles I came across this good sized cave, so I decided to see how far back into the cliffside it penetrated. 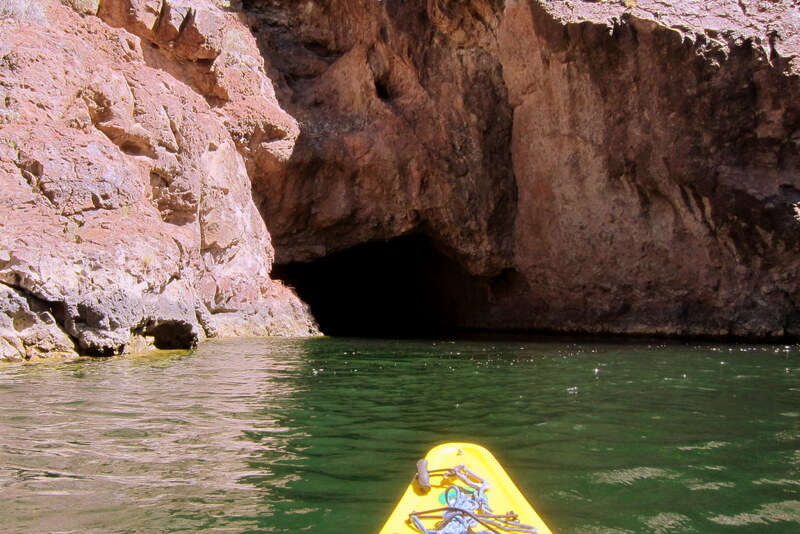 It only went back in for about 30 feet, but it did open into a large chamber big enough to turn the kayak around. It was cool and damp, and kinda spooky so I didn’t hang around long. 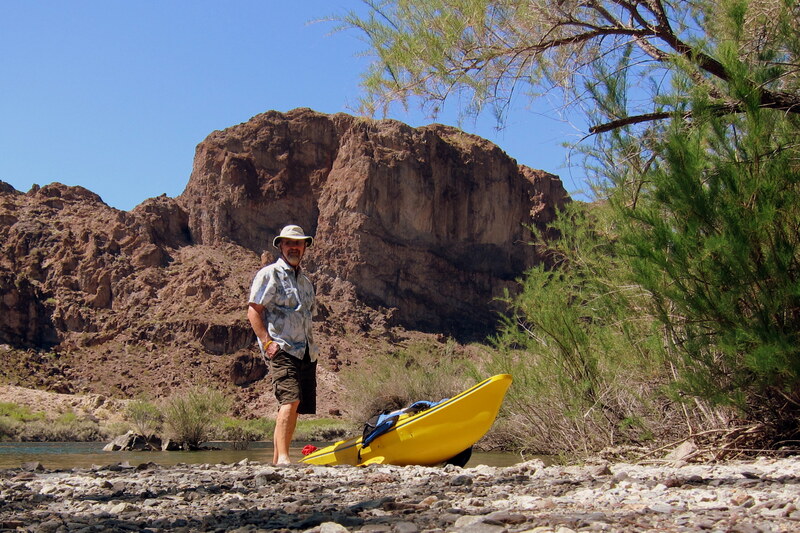 After about four hours of paddling, I rounded a bend in the river and was confronted by a stiff breeze. That coupled with the river current caused my little craft to make very little headway. So I prudently decided it was time to turn around and basically “go with the flow”. It was also time for a break and lunch so I found one of the few beaches where one could make a landing. 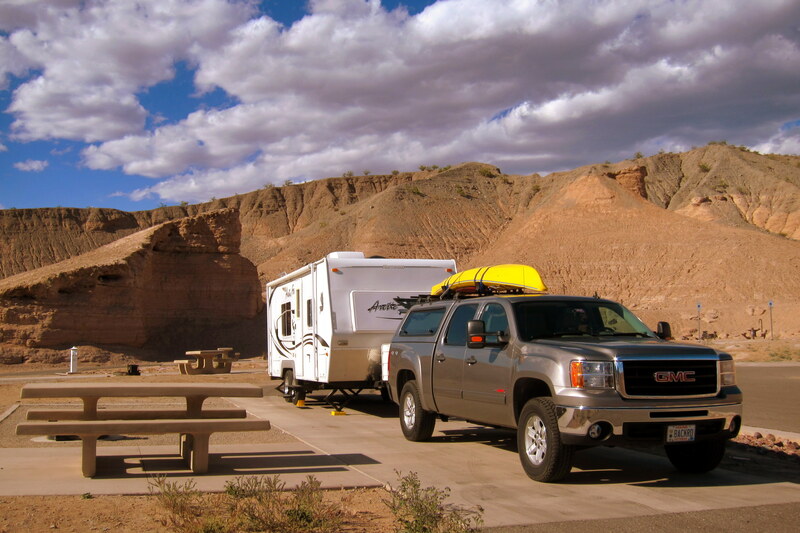 It happened to be on the Arizona side of the river, however in the background is the Nevada side. It was obvious that many river travelers had used this beach for a break and likely fed the two resident ducks…..they showed no fear as they paddled about the little cove waiting for a sample of my lunch. After eating, I scrambled up a rocky trail to a small overlook so I could get a different perspective of the river. Also overlooking the river is the foundation for the “River Gaugers” house. 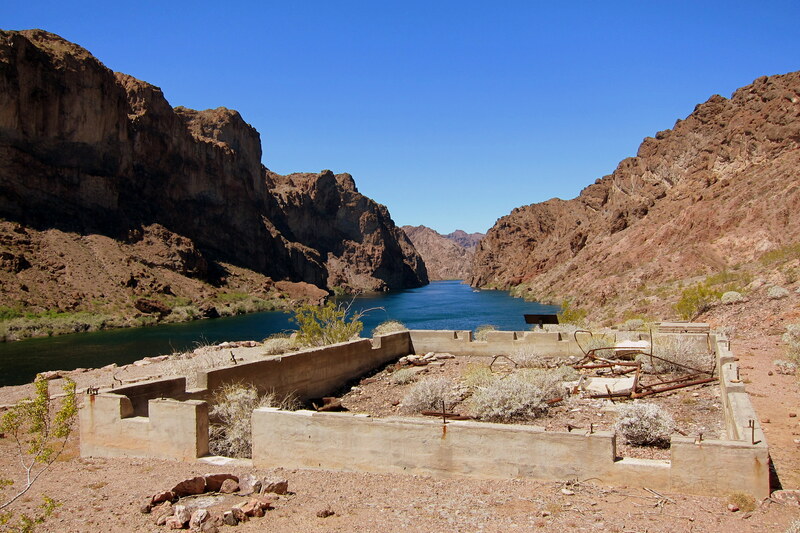 During construction of the Hoover Dam from the 1920’s to 1935, the person living in this one room cabin had one prime responsibly…..to gauge the river’s seasonal characteristics. A few times a day he would use a cable supported cart to haul himself out over the roaring river and take flow measurements and water samples. Great view…..and a great job for a hermit! 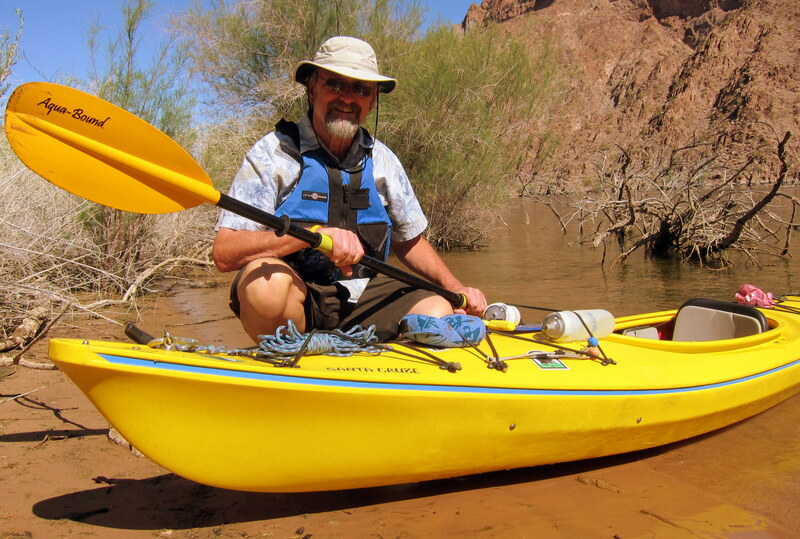 Back on the river I was floated along while Mother Nature provided the propulsion…..basically just dragging a paddle blade to steer the kayak. As I rounded a bend in the river only about 5 feet from a sheer rock face, I was startled by two ducks flying full tilt about four feet off the water. Actually, I’m not sure who was more surprised….me or the ducks. 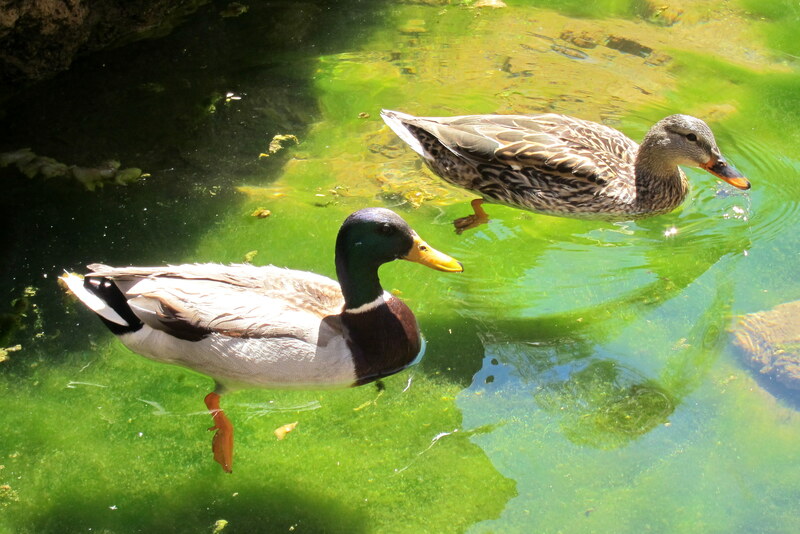 Anyway as I ducked, (pun intended) the ducks humaned, (yea, it’s a word) and we avoided a rather messy collision. Floating down river with the combined current and tailwind I was making about 3 MPH headway according to the GPS. 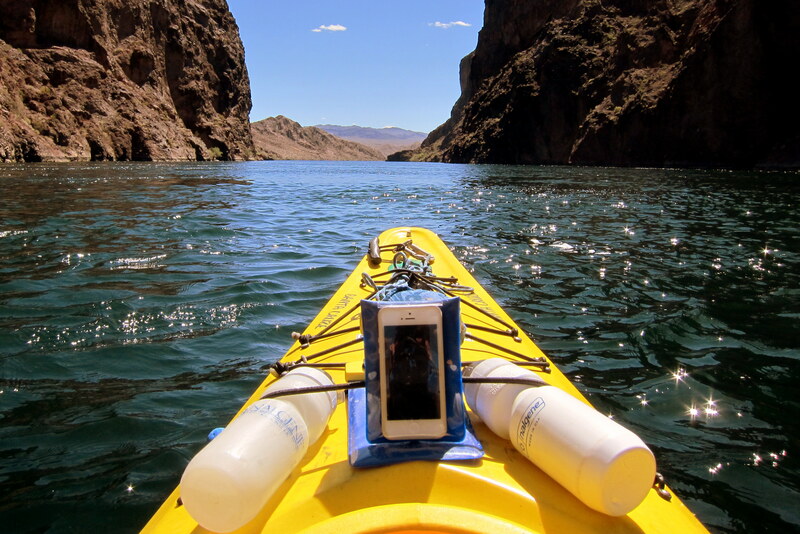 OK, that gadget in the dry sack is not technically a GPS…..but it is a GPS app installed on my iPhone called GPS Tracks. My Geocaching buddy Randy back home in Maine told me about the app and it works as well, if not better then, my dedicated GPS unit which admittedly is a number of years old. Anyway it’s pretty slick, I highly recommend it as a download…..after all most of us always have our phones with us but few folks think to carry a GPS unit around! For a statistics geek like me, GPS Tracks is incredible! It had been a thoroughly enjoyable day on the water. 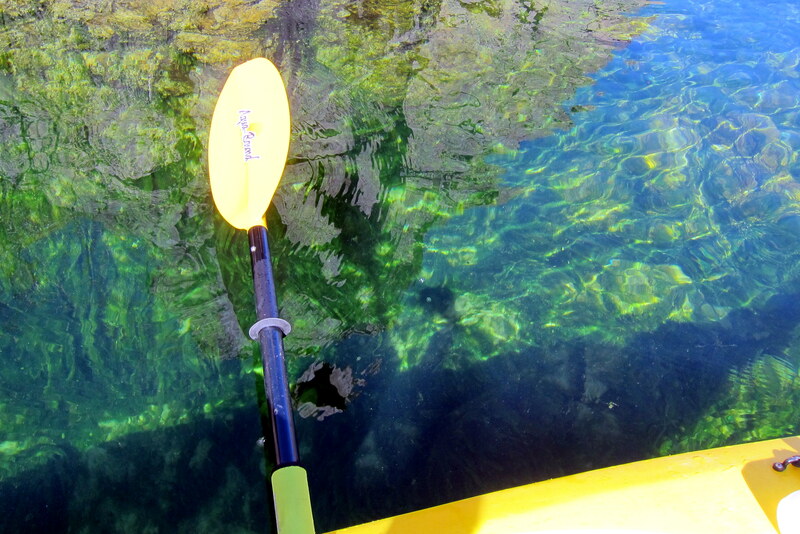 Sometimes I question whether it makes sense to drag a kayak about the nation…..days like this make it all worthwhile! Wednesday, April 3, 2013: Up to sunny skies with temperatures quickly rising into the mid 70’s. 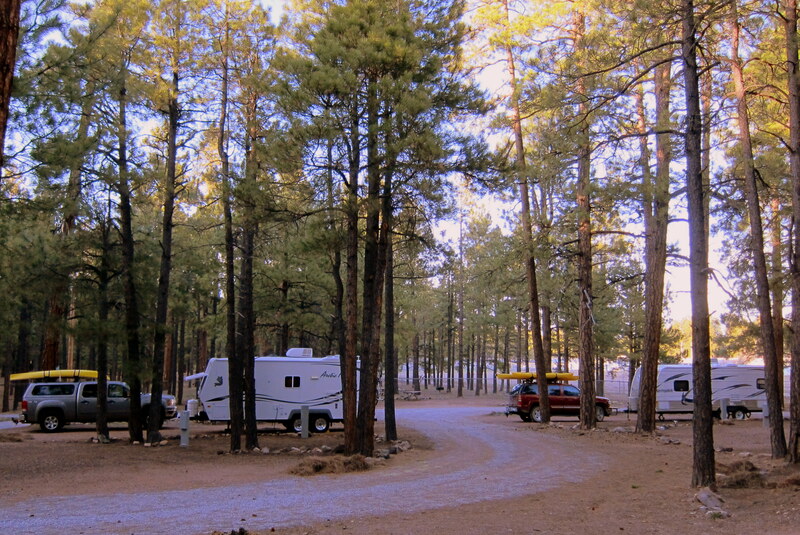 We broke camp, stopped by the marina and store to oz around and then up the long windy road to US-93. 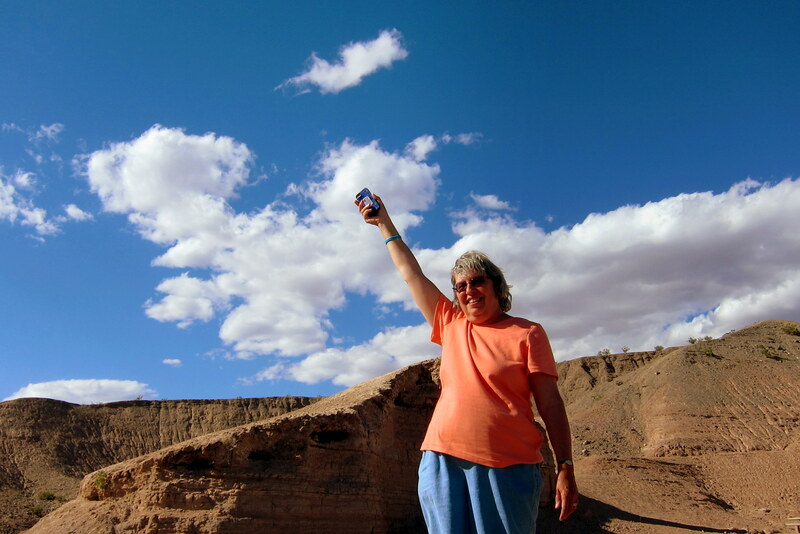 Reaching an elevation of 1,268 feet…..cell service was restored…..Kit was now officially a “happy camper”! In a few hours, we reached the town of Kingman, Arizona, then hopped on to I-40 and made tracks easterly toward Flagstaff, Arizona. Wasn’t really planned, just felt like the right thing to do since we had not explored that portion of northern Arizona very thoroughly. About a half hour east of Kingman we received a call from Dewey and Bea. 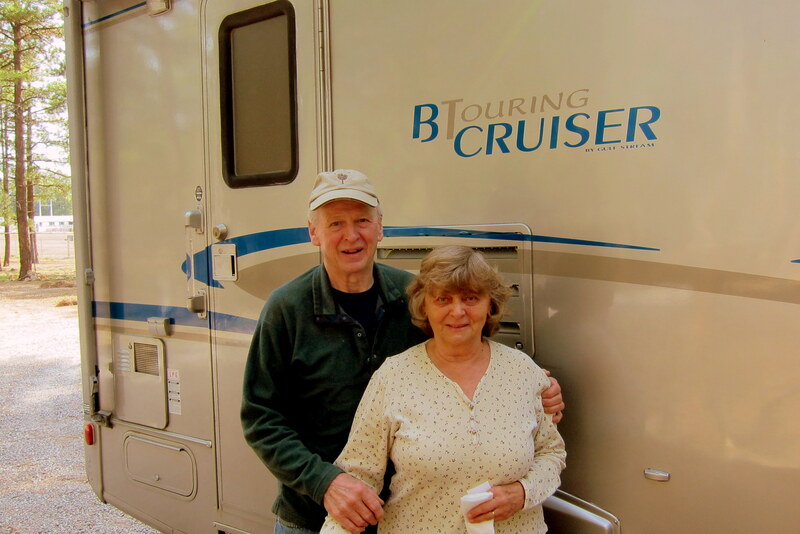 They had been on an adventure of their own in their new camper. 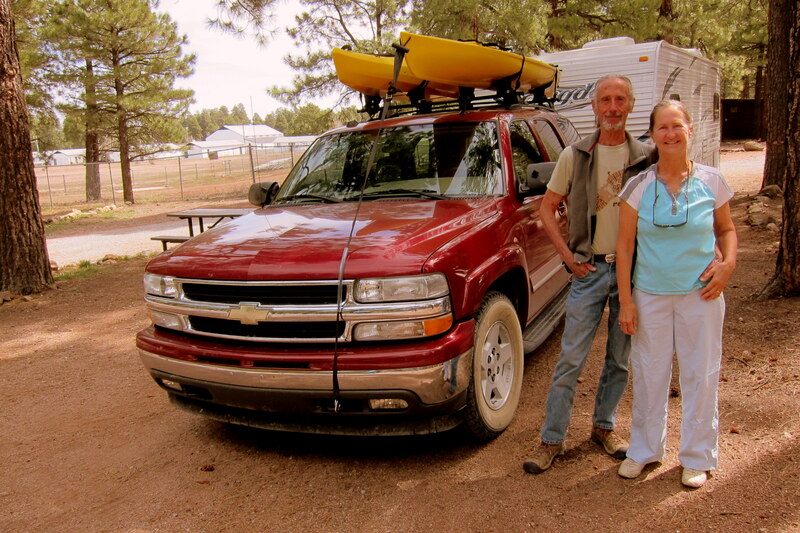 We had been trying to figure out a place to hook up for a few days of joint camping (no…..not that kind of “joint”). Since they were about a half hour west of Kingman, looks like Flagstaff will be it! 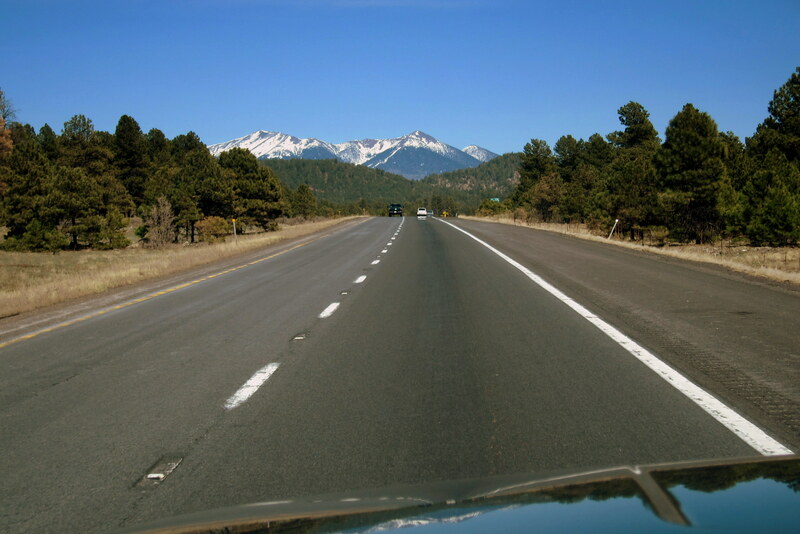 I-40 east is a steady climb…..soon we were trudging past 2000, then 3000, then 4000, then 5000 feet before topping out at 7335 feet when we tipped over the Arizona Continental Divide and started to gradually descend. Talk about travel whiplash! From 500 feet elevation to over 7,000 feet, with the corresponding drop in temperature and the change from desert vegetation to mountain forest in a little over three hours was pretty dramatic! 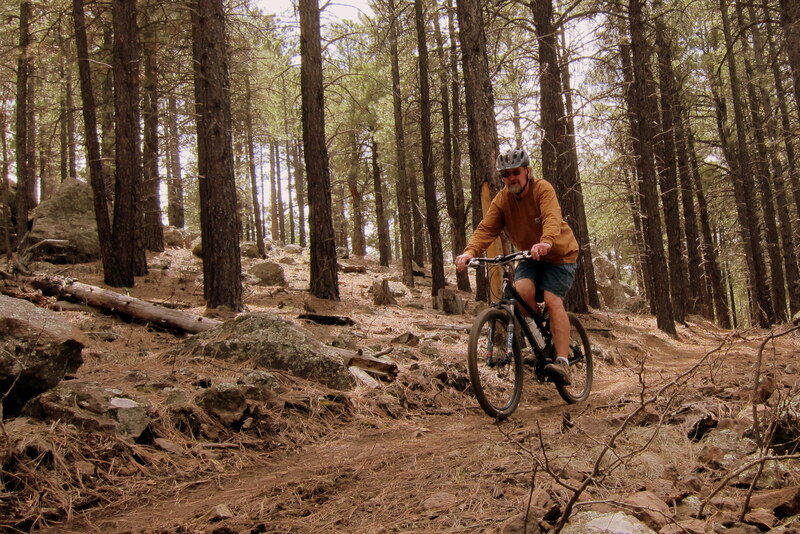 Entering the town of Flagstaff, we headed south a few miles to Fort Tuthill County Park. Fort Tuthill was once an Arizona National Guard training facility until shortly after WWII when it was closed and turned over to local jurisdiction. On the grounds there is a fair complex, horse race track, equestrian center, an outdoor adventure park, hiking and biking trails and two campgrounds, a county facility and one managed by nearby Luke Air Force Base. 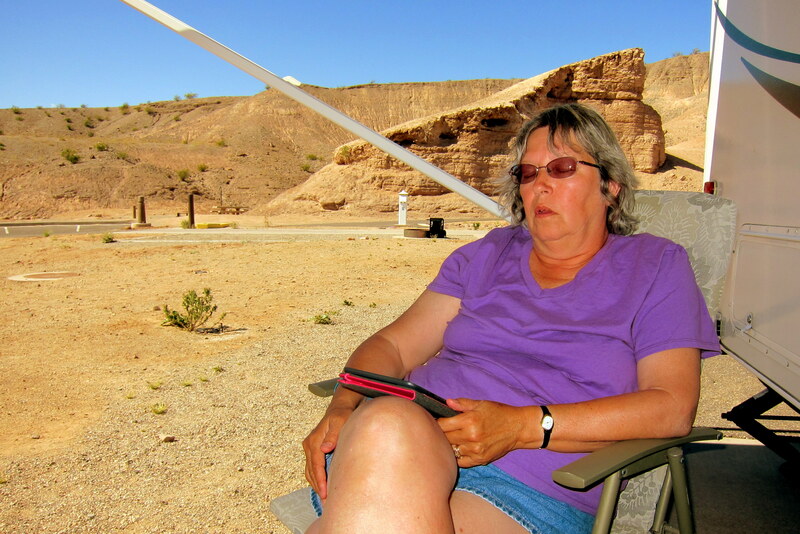 We decided to stay at the military campground…..yea, I know, big surprise! It was nicer, had a better layout and the most important factor? It was open for business…..the county park would not open for another month! 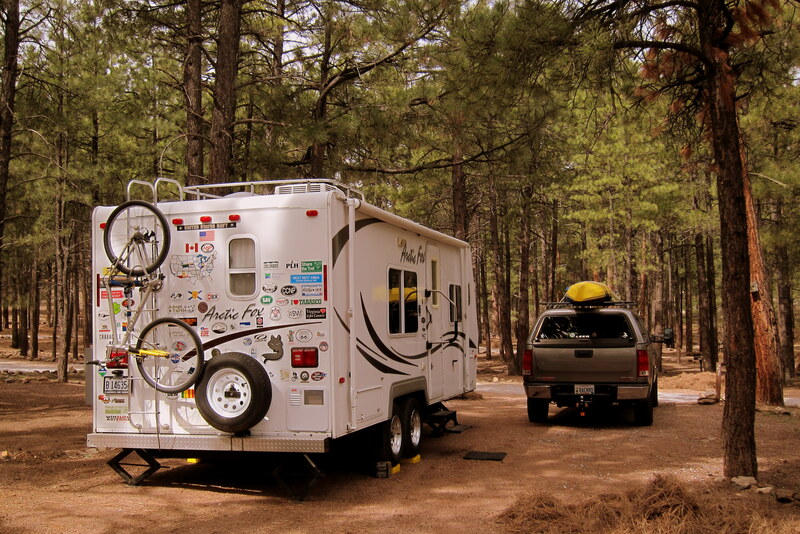 Shortly after we arrived, a Class C motorhome pulled in across from us sporting Maine license plates! Now, you should know that Maine state law requires all snowbirds to migrate to Florida. However there are a few scofflaws that head west…..in fact, this is the only other Maine plate we’ve seen this year west of the Mississippi! Turns out that Ron and Clara are from Rangeley, Maine. Ron is an airplane pilot that was previously under contract to Mountain Air, a service we used extensively for radar alignment purposes back in my working days. In addition he was a close personal friend of Mountain Air’s owner and chief pilot Stephen. In fact, they were building a Kitfox experimental aircraft together back in 2000, when Stephen was involved in a fatal air crash. It was obvious that the loss of his friend and business partner affects Ron still. We exchanged contact information and will try to visit when we both return to Maine from our RV trips. Thursday, April 4, 2013 through Sunday, April 7, 2012-Flagstaff, Arizona: What a change…..this morning we woke to morning temperatures in the twenty’s! In fact it has been so cold the water in the campground had not been turned on. However electricity is available, which is a good thing as this is the first time we have needed heat in the camper in over two months! 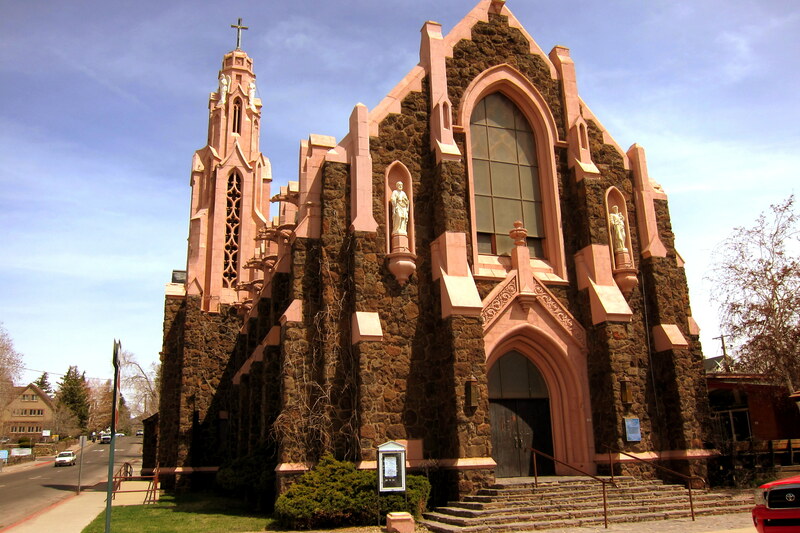 Since Dewey and Bea were not going to arrive until the afternoon, we decided to head into Flagstaff to poke around the historic district. A rather unique structure we came upon was the old Catholic Church, built in the 1920’s. The material for construction was volcanic rock taken from the lava fields just west of town. This rather porous stone has kept the parishioners warm and dry for over 80 years and looks like it will serve the purpose for many years to come. 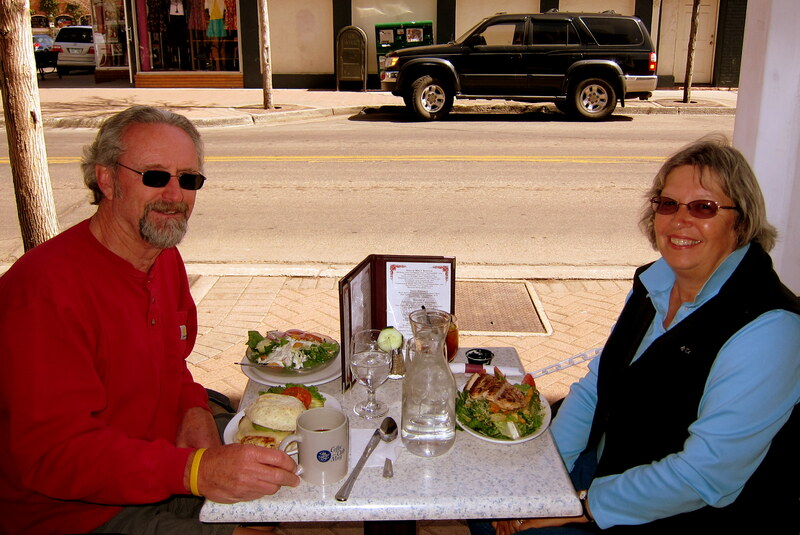 Since it was my birthday, Kit treated me to a nice relaxing lunch at the historic Weatherford hotel. Back at the camper we anxiously awaited Dewey and Bea’s arrival. We were able to sponsor them at the military campground and I selected a campsite next to ours for the next couple of days of their stay. After they got settled in we gathered for fun, food and drinks until the wee hours of the afternoon. It was a bit cold, so we bundled up and endured with the help of some consumable antifreeze. Here Kit is researching on her iPhone the proper ingredients to make a “Slippery Navel”. 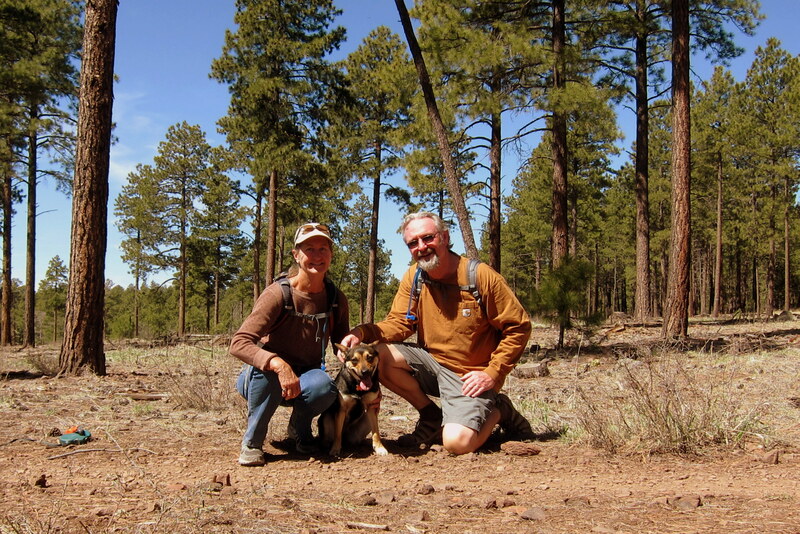 On one of the days we were with Dewey and Bea, we all decided to explore three nearby National Park facilities…..Walnut Canyon, Sunset Crater and the Wupatki Pueblo. 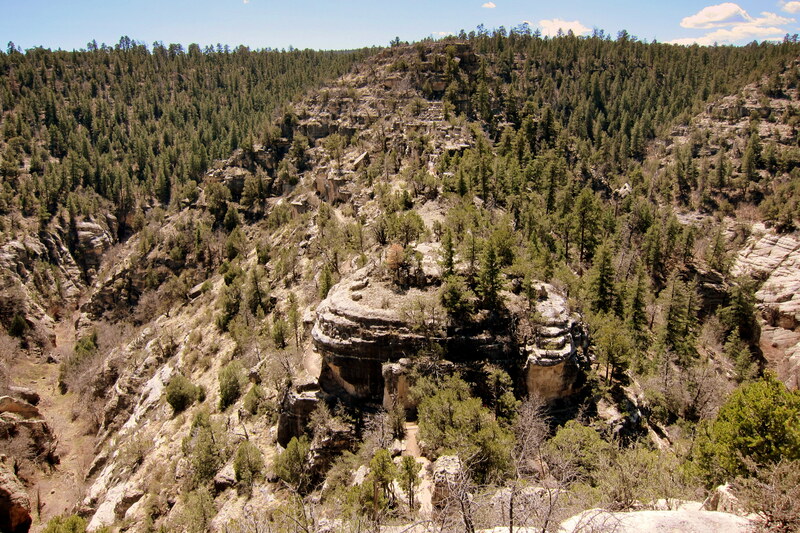 The first stop of the day was at Walnut Canyon National Monument. Here there is a path called The Island Trail that leads down to the “sky island” seen in the photo below. 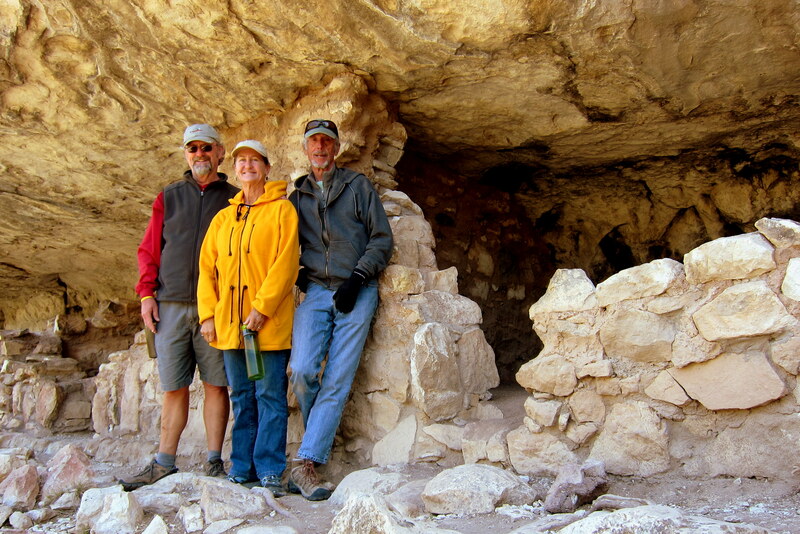 Around the year 1200, the native people that settled this region built small cliff dwellings along the rim of the island by taking advantage of naturally occurring shallow caves and building rock and clay walls to enclose them. The trail encircles the island and allows access to the many dwellings along the rim. Only inhabited for about 100 years, anthropologists are stumped as to why the tribes abandoned the area but speculate either drought and/or the rumblings of seismic activity in the area caused their hasty departure. After a pretty vigorous hike in Walnut Canyon, we were ready for lunch. Fortunately Dewey and Bea had an app loaded on their iPhone’s that listed all the restaurants featured on The Travel Channels, Diners, Dive-in’s and Dives (DDD). Since the app grabs your location from the phones GPS it lists places that have been featured on the show that are near your current location. 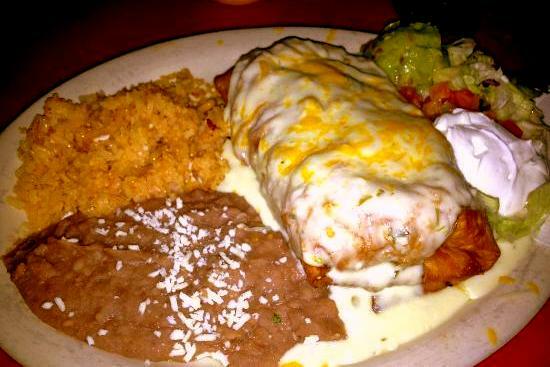 One place the DDD app recommended was a Mexican restaurant called, Salsa Brava Mexican Grill. And, as you can see…..the quantity was incredible as well as the quality. The salsa bar featured eight different traditional salsas featuring various heat components and a few Salsa Verdi offerings as well. Looks as if the DDD App is another download for the old iPhone……wonder if I can actually make calls with this thing as well?!?! After an incredible meal, we were ready to take on the rest of the day. 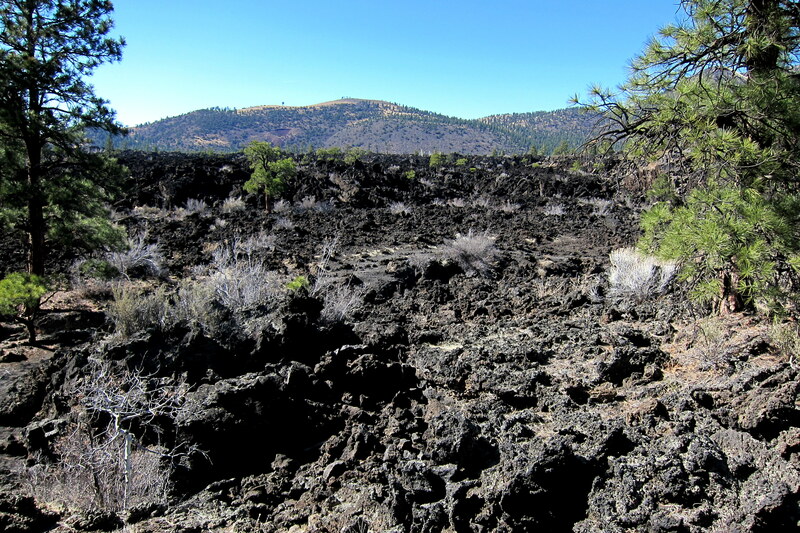 Our next stop was Sunset Crater Volcano National Monument. The volcano erupted around the year 1050 creating a 1,000 foot cinder cone rising above the desert floor and spewing ash for miles about. The volcanic material quickly broke down into fertile, moisture absorbing soil. 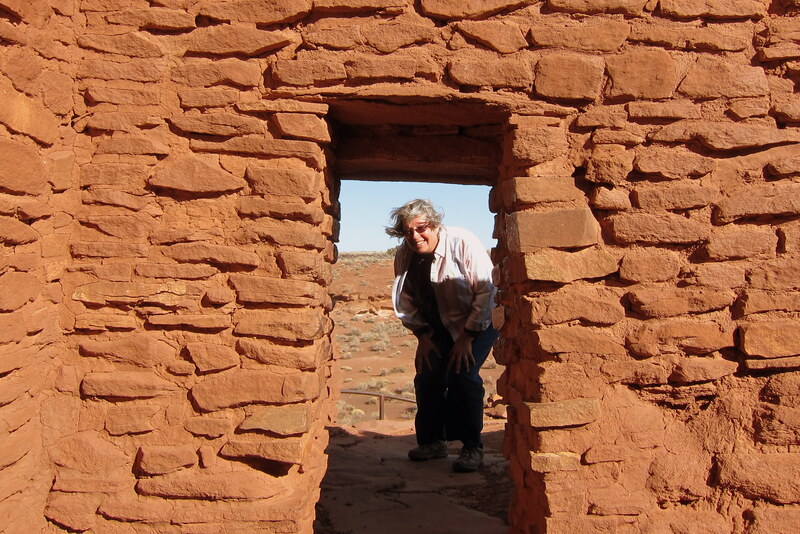 This was soon followed by migrating native peoples that decided to settle in the area and build a communal shelter, which brings us to our final stop of the day…..Wupatki Pueblo National Monument. 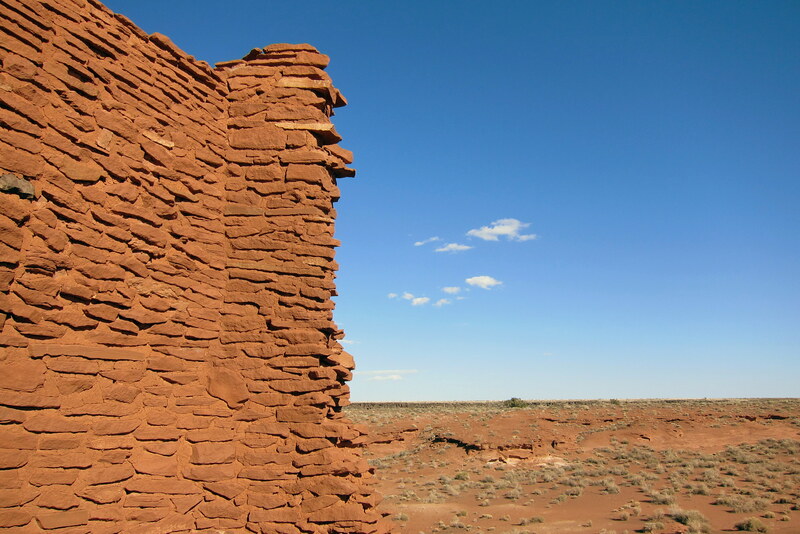 Many of the native dwellings in the southwest are ruins, basically left as they were found. Others have been restored as they might have appeared by using materials found about the ruins. 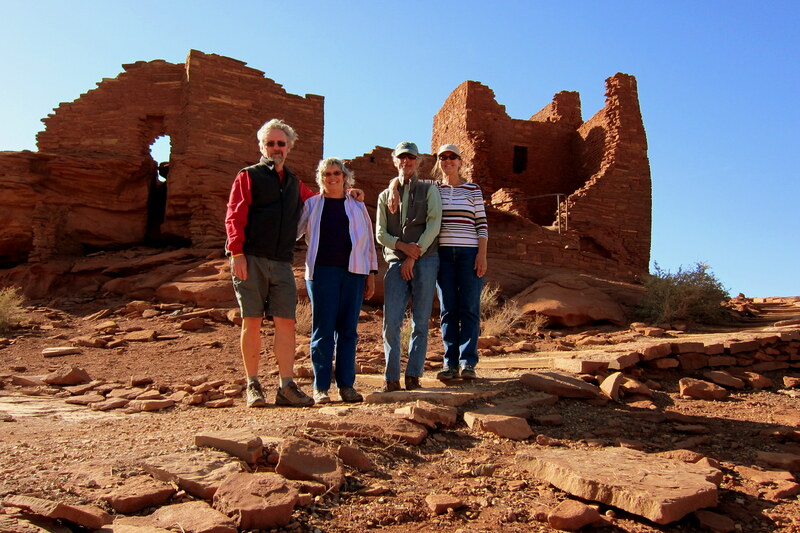 This pueblo is unique as it is original…..basically it is as it stood when the National Park annexed the area in 1930. There have been some stabilization efforts, but no rebuilding. 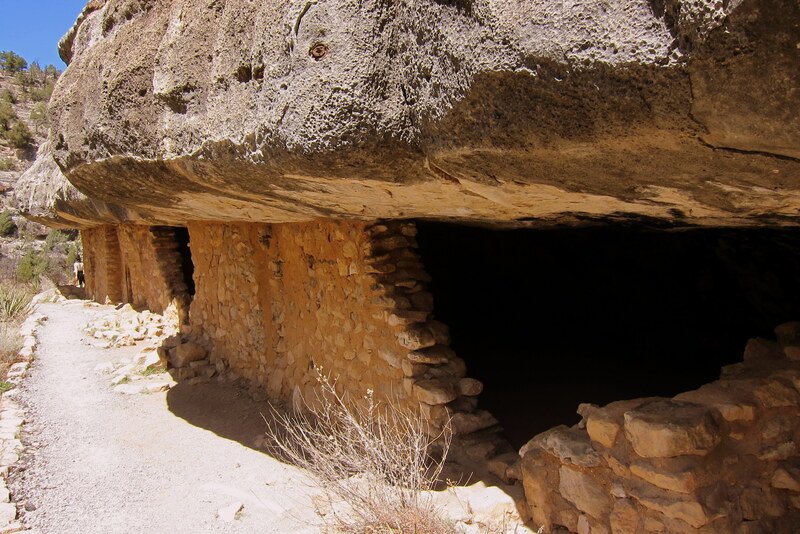 The pueblo at one time featured over 100 individual rooms and despite the ravages of time, weather and early artifact hunters, remains as a testament to the building skills of early native peoples. The doorways supported by small timbers are barely 3 feet tall and were likely covered with animal skins in an effort to retain heat during the cold winter at this 7,000 foot altitude. One often hears the phrase, “if walls could talk”, well this is one case that I wish they could…..oh, what a story they could tell! Um, well…..actually, talking walls might be more interesting than what they might have to say. Just sayin’. 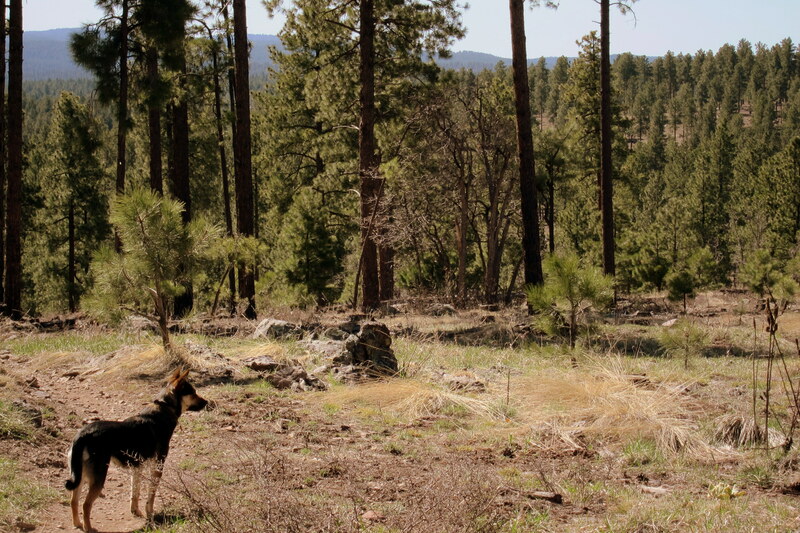 The final day with Dewey and Bea started out by Bea, Kali and I taking a nice walk through the Ponderosa Pine forest behind the campground. Yep…..time to launch GPS Tracks on the old iPhone! Instinctively Kali knew exactly where to go and was one of the best dogs off leash that I’ve ever seen out on the trails. At times, she looked like a coyote sulking about looking for its prey. Man, I like that app! Bea has a friend and former co-worker that has retired to the Flagstaff area. 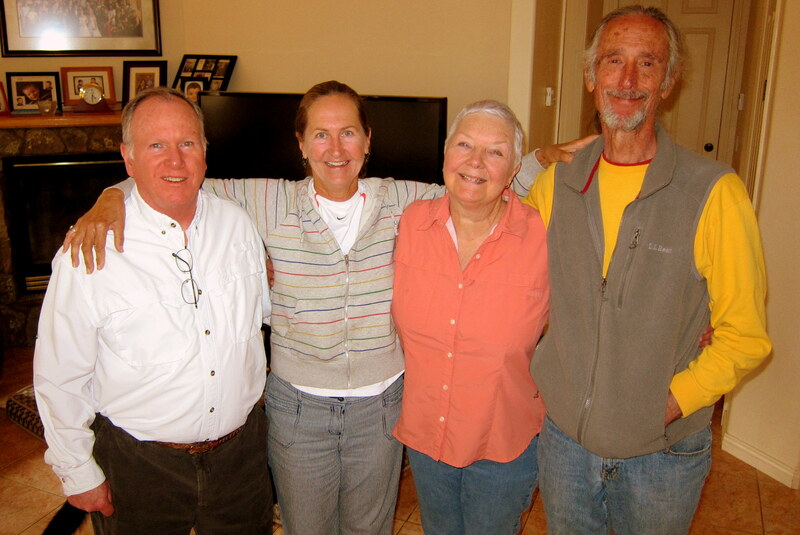 John and Mary Ellen graciously invited us to their beautiful country home at the base of 14,000 foot Mount Humphreys. Being tired of eating out and even more tired of our own cooking, we quickly accepted the offer. After a very pleasant and all too short camping visit, Dewey and Bea had to get on with their own excellent adventure. Till next time guys…..love you! The final day at Fort Tuthill, Kit just wanted to Veg, and Bill just wanted to play…..pretty good compromise I’d say. As I left Kit relaxing with her book, I took my bike out for a little romp in the woods. Started out on the Soldiers Trail that is supposed to loop around the Fort Tuthill complex. After about an hour I came to another loop trail off of that. Well after another hour, I was officially lost! 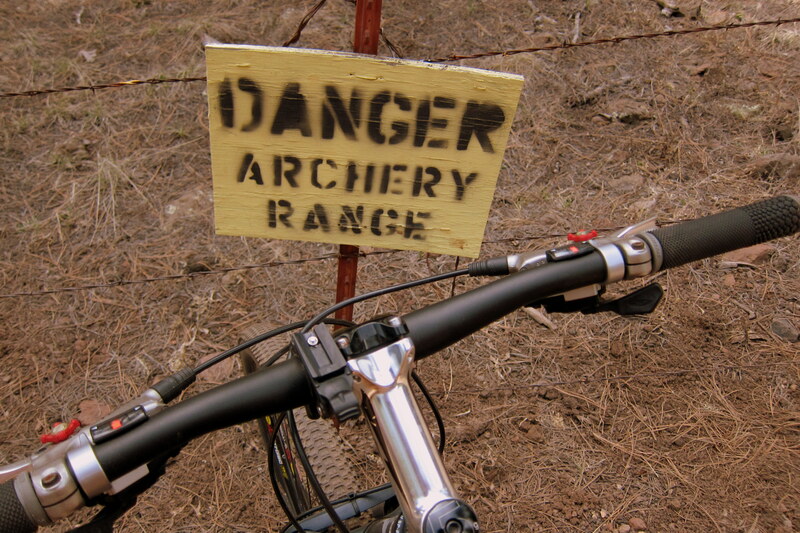 Soon, I came to this rather disturbing sign alongside the trail. Fortunately I had remembered to start GPS Tracks and so I pulled up the app, checked the map, discovered where I had zigged when I should of zagged and within 15 minutes was back on track. Great ride through some beautiful countryside. However the 7000 foot altitude did take a toll on my lung efficiency…..usually my legs give out, but in the thin air my lungs cried foul first. Have I mentioned how much I like GPS Tracks? Back at camp, after some rest and nourishment, I remembered the Travel Bug that I had obtained from a geocache a few months ago…..well time to get it on its journey once again. According to Geocache.com, there was a cache within a mile of the camper, back in the same woods I’d previously hiked and biked…..probably passed right near it in fact. Well, after using the iPhone app to get me to the vicinity I started searching, and searching, and searching! Then I remembered a hint from Randy about sitting and observing and thinking…..if I were to hide a cache in this area, where would I place it. Within minutes I spied an old decaying log and there it was! 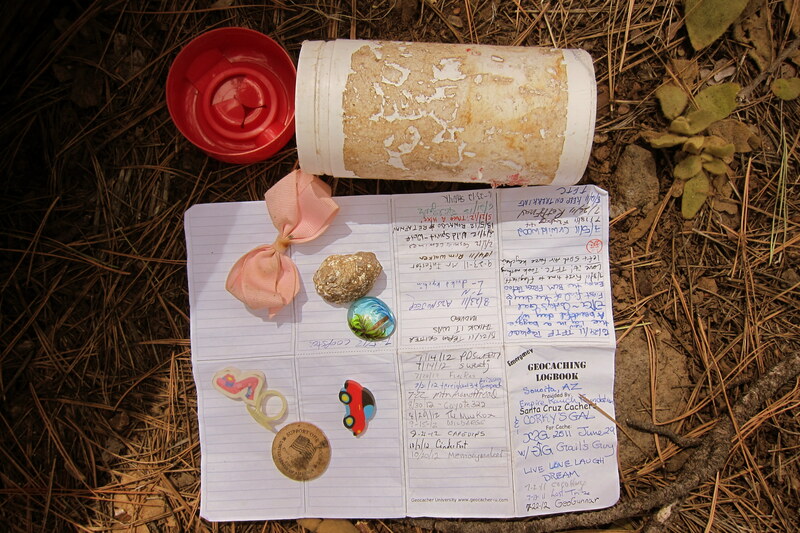 There were a number of items in the cache to choose from. 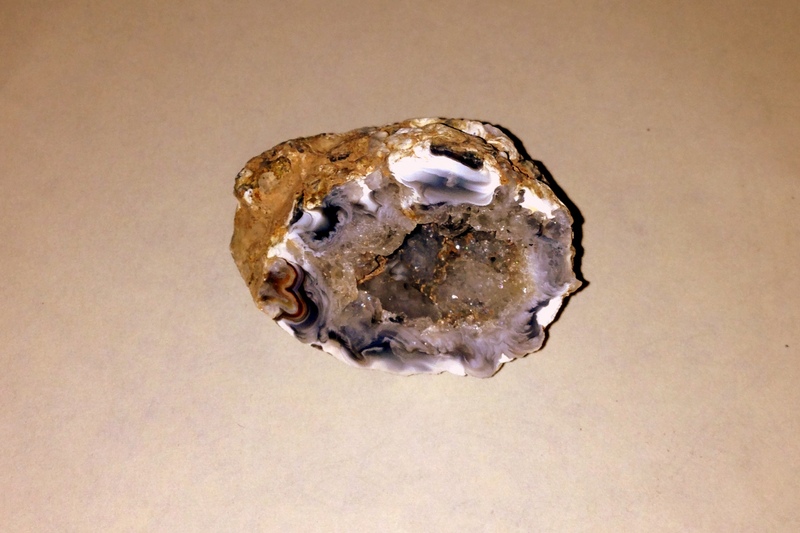 I selected a small Geode and left the Travel Bug. 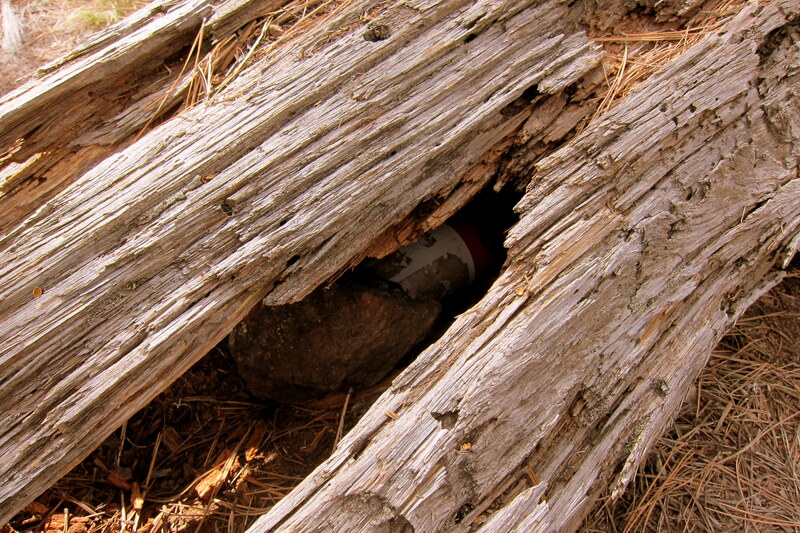 Then signing the log and sealing it up tight, I returned the cache to its very effective hiding place. Well, tomorrow we hit the road once again…..where to? Stay tuned! 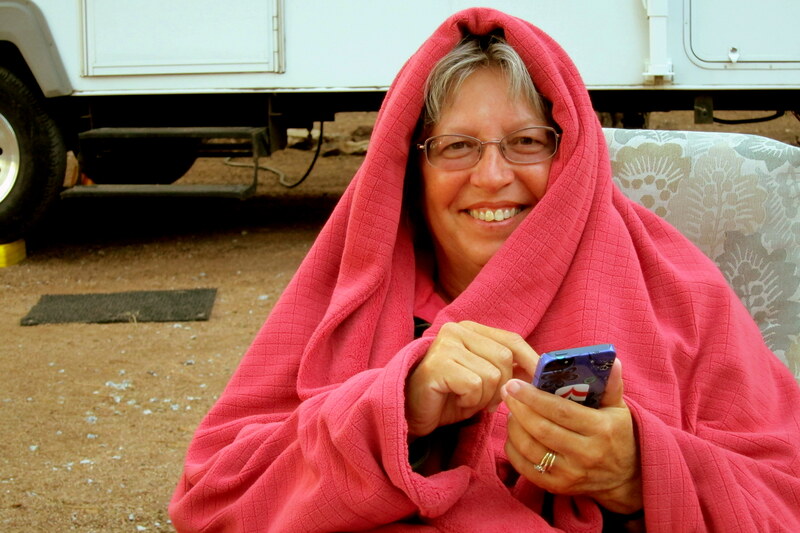 Kit’s Corner: Yes, I admit to needing a cell signal at ALL times! Never thought I would get to this point. Being a news junkie like my mom was, I need to know what’s going on in the world at all times, but, more importantly, I want to be able to connect with our kids and grandkids at any time. Not that they have any time to chat, they are all very busy but just knowing that I can get in touch makes me feel better. It’s like having a car in the driveway, even though I have no place to go; or, having a pound of hamburger and a pound of chicken in the freezer at all times. Guess it’s a “Mom” thing. Not a bad thing…..your mom is pretty cool! Miss you guys, see you soon, love you! Once again! Enjoying the photos and blog of your journey! Thanks guys…..hope to visit with you all again on our next trip south! I’m with you Kit, always want to be accessible to the family, even if I don’t have anything to say. Yep, its a wonder how we traveled 40 years ago without cell phones, GPS, and tablets?!?! They all seem so indispensable nowadays. please give us a call if you folks get anywhere near Maine this summer! Thanks for the nice comment, yep the US is a beautiful and exciting place to explore! Have a safe trip south and good luck on your relocation…..maybe we will bump into each other along the road! Great time meeting on the trails. Willow creek is a must, glad it’s in our backyard. See ya next spring for the big event. We had a blast camping with you folks…..looking forward to much more in the future. Take care of each other…..love you! As always, enjoy your journal and all of the beautiful pictures. We live a part of our lives vicariously through you! We arrived at Sandy’s today and I must say it’s wonderful to see her getting around so well after the limitations on her activity when we left after Thanksgiving. On our way here we passed “Bill Tucker Rd” off US 301 in Hillsborough county FL. It was right next to “Big Bullfrog Creek”. How ’bout that?? Thanks folks, always great to get your comments on our travels and to hear that Sandy is doing so well. I wonder who the Bill Tucker is that deserves a Florida street named after him? Think I’ll have to research that one! See you soon!! Oops…..guess I had already replied to this comment.